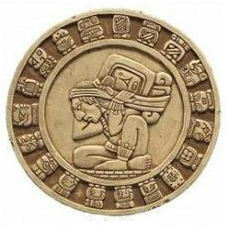 Mayan one: "Okay guys I've finished the calender!" Mayan two: "But it only goes up to 21.12.2012"
Mayan one: "Ah don't worry about it we'll make a new one before then. I would have carried on on this stone but I ran out of room." Mayan two: "Fair enough. Hey, imagine if people thought that the world was gonna end because you couldn't find a bigger stone." Mayan one: "Yeah, but you'd have to be pretty stupid to think that wouldn't you?"